Movement joint profile made of stainless steel. Allows for horizontal movement via a tongue and groove connection and is particularly suited for tile and stone surfaces subjected to heavy use eg. in warehouses, shopping centres, underground car parks etc. Movement joint profile in a choice of aluminium or stainless steel, with replaceable movement zone of soft rubber. Particularly suited for tile and stone surfaces subjected to heavy use eg. in warehouses, shopping centres, underground car parks etc. Movement joint profile made of stainless steel, incorporating fixed movement zone of soft rubber. 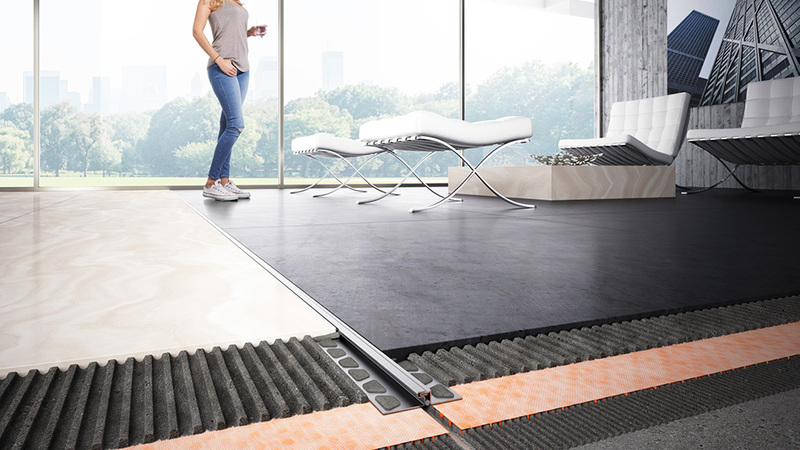 Designed for use with floor coatings and other thin floor coverings. Movement joint profile made of aluminium, with fixed movement zone of soft rubber. Suitable for areas exposed to foot or light vehicular traffic. Movement joint profile made of PVC, with 10mm-wide movement zone to accommodate relatively high levels of movement. Common uses include residential projects, as well as offices, salesrooms and other areas with medium traffic loads. Also suited to exterior use. Movement joint profile made of PVC, with 5mm-wide movement zone to accommodate lower levels of movement. Movement zone matches common grout joint widths, making for a particularly discreet effect. Common uses include residential projects, as well as offices, salesrooms and other areas with medium traffic loads. Also suited to exterior use. Rigid PVC profiles that combine decorative design with a stress relieving function. Each features two different coloured usable surfaces of soft PVC.